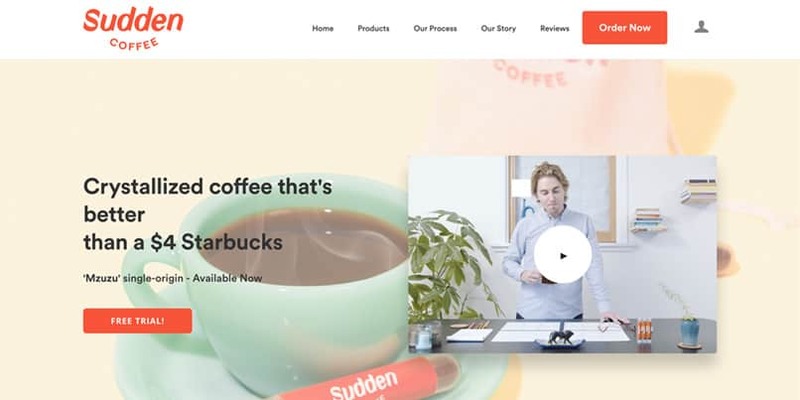 Sudden Coffee Review: The Best Cup Of Joe When You're On The Go? Instant coffee has a bad reputation. More often than not, the taste and lack of quality ingredients offsets the convenience of being able to make a quick cup of joe. As a coffee lover myself, I had written off instant coffee as a “last resort”. Well, that was until I heard of Sudden Coffee. 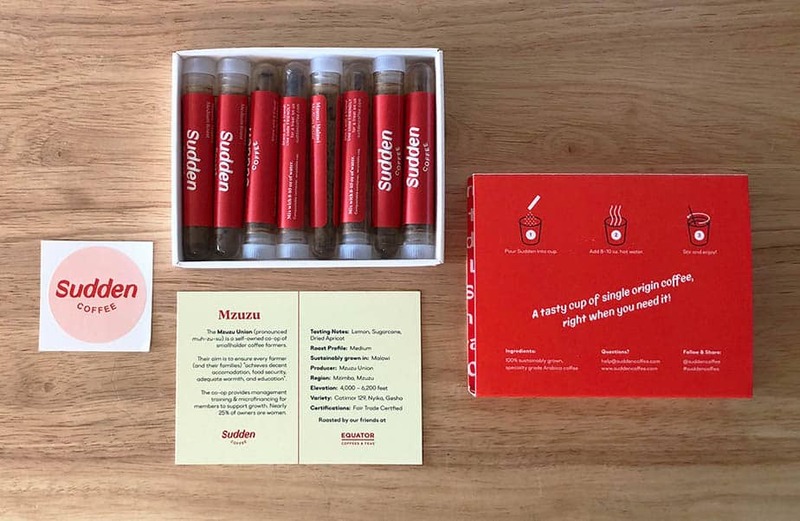 Sudden Coffee’s mission is to make great coffee easier for everyone to experience. That’s what brought founders, Kalle Freese and Josh Zloof to start the company in San Francisco, California back in 2015. Freese has been ranked the ninth best barista in the world and Zloof is a McKinsey trained techie who just happens to enjoy the culinary arts as well. Each coffee they provide via Sudden Coffee has been hand-picked, brewed, and distilled by Umeko Motoyoshi. Motoyoshi got her experience by working at world renowned Seattle and San Francisco cafes like Blue Bottle. While Sudden Coffee is technically “instant” coffee, I hesitate to call it that. Why? The sourcing, beans, brewing, and overall creation of their coffees are on another level compared to any other instant coffee brands I’ve tried in the past. If you’re interested in learning what makes Sudden Coffee so unique, how it tastes, and more, you’re in the right place! If you want to give Sudden Coffee a try for yourself, you have a few options when setting up your first monthly delivery. This will allow you to customize it to your taste preferences, as well as how much coffee you prefer to drink within the span of 30 days. 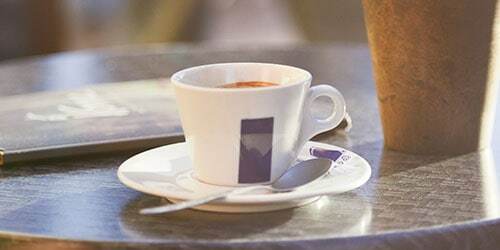 Light Roast: Most people think the lighter the roast, the less caffeinated and flavorful it is. That couldn’t be more wrong. The longer that the beans are roasted, the more that the caffeine and flavor is pulled from the bean. Thus, a lighter roast tends to have more caffeine plus stronger origin flavors and aromas. Medium Roast: While a medium roast will still maintain a lot of the caffeine and true flavor profile of the beans, it has a slightly “deeper” flavor profile when compared to a light roast. Next, you’ll need to decide how many cups of coffee you’d like to make. There are options for 8 cups, 16 cups, 24 cups, or 32 cups. Deliveries of Sudden Coffee can come as frequently as once per month. You can also choose fewer deliveries if you’d prefer. You can change this whenever you need to. And of course, you can cancel anytime if you decide you’d like to take a break from their service. As mentioned above, every cup is made with single-origin beans, which are widely regarded as the best type of coffee (over blends). Put simply, single-origin beans are picked by hand, usually in local farms in equatorial countries. By working with one coffee bean farm, overall quality (from bean to roast) is able to be controlled more effectively. Sudden Coffee says their secret brewing technique allows them to capture the “complex, fruity flavor notes without the bitterness that instant coffee is known for.” That being said, they avoid making instant coffee by brewing at high temperatures, which is what many other companies do, ultimately resulting in a bitter and burnt-tasting cup of coffee. After brewing, the coffee is freeze-dried in small batches. This is a way of dehydrated the coffee by using a vacuum instead of heat, which allows them to preserve the aromatic molecules. And because the coffee is freeze-dried, it actually has a six-month shelf life, so you don’t have to feel like you need to make it right away. Their coffees change every so often, so you’ll have to check back to see exactly what they’re offering at the time you’re ordering. However, to give you an example of the variety they offer, one month, they developed a medium roast from Mzuzu, Malawi. It’s a single-origin coffee that has been roasted at Equator Coffees. Sudden Coffee offers their monthly deliveries, but they do have individual items as well. Those individual items include a small 8-cup pack, a 48-cup box, and even a Sudden Coffee travel mug. Currently, Sudden Coffee is only able to deliver orders to those located in the United States and Canada. They plan to expand their service internationally in the future, so keep checking back if you aren’t in their delivery area right now. Speaking of delivery, shipping is free on recurring deliveries, so you don’t have to worry about any extra costs there. Sustainability is important to Sudden Coffee, but not just with the coffees they’re producing. It’s also reflected in the the packaging they choose to use for their products. The tubes that your coffee beans come in are made of a compostable PLA plastic, as is the label on the tube. Their website states they’re often working behind-the-scenes to improve their environmental impact, from reducing their plastic, water, and energy use by 80%. Any food/snack/drink company that is actively working to make their product and packaging as environmentally friendly as possible gets a thumbs up from me! Inside your box, you’re also going to find tips and tricks about coffee to help you become a coffee aficionado. There’s also a sheet that tells you all about the coffee you’ve received. You’ll get to learn about about the flavor profile, where it came from, and more. The added touch Sudden Coffee puts into educating their customers definitely makes them stand out among the rest. One of the worst things about brewing your own coffee at home is the fact that coffee beans lose their flavor the more they sit out. Sure, a bag of coffee that has been sitting in your pantry for a month or two might technically be okay to drink but will it taste good? Chances are it won’t. You don’t have to worry about that happening with Sudden Coffee. Their process of freeze-drying immediately after each roast helps to preserve the aromatic molecules, whereas freeze-drying with heat can create a bitter taste. After the coffee is freeze-dried, it’s packaged in their air-tight, compostable tubes. Those tubes have a shelf life of six months or longer. That means you don’t have to worry about it losing its flavor within a few days, like what happens with large coffee jars. Brewing your first cup of Sudden Coffee is just like making any other cup of instant coffee. All you need to do is grab your mug, pour in the crystallized coffee from a fresh tube, and then top it off with hot water. Do a quick stir and it’ll be ready for you to drink. No machines or filters needed. Of course, you can always add your favorite creamers, but it’s worth giving these coffees a taste on their own to really pick up on and enjoy the flavors they have. In our first box we received medium roast coffee from Mzimba, Mzuzu. Here’s what it said about the region on our little informational card: “The Mzuzu Union is a self-owned co-op of smallholder coffee farmers. Their aim is to ensure every farmer (and their families) achieves decent accommodation, food security, adequate warmth, and education. The co-op provides management training and microfinancing for members to support growth. Nearly 25% of owners are women.” The card also notes that its flavor profile includes lemon, sugarcane, and dried apricot. In terms of taste, it was a bit lighter than I would expect from a medium roast. That being said, it may have been because the citrus flavors that were offsetting the traditional coffee flavor. From the first sip you could taste the subtle notes of lemon and apricot. And while it technically has sugarcane listed as part of its flavor profile, the sweetness of isn’t overbearing. In fact, I barely noticed any sweetness at all. In my opinion, the overall flavor much more robust than what you’d find at a chain coffee store. Uninterrupted by milk or cream, you should definitely be able to taste the difference. It’s delicious. So, how much is it going to cost for you to get your Sudden Coffee fix? Well, that depends how much you choose to order. If you go for Sudden Coffee’s 8-cup plan, you’re looking at $22 per month. This plan is perfect for the occasional coffee drinker and it’ll cost you approximately $2.75 for each cup. If you need a little more java than that, go for the 16-cup plan at $44 per month. There’s also the 24-cup plan for $66 per month and the 32-cup plan for $88 per month. If you’re looking for an easy way to get your coffee fix, Sudden Coffee is worth checking out. In the world of instant coffees, it’s one of the best I’ve had the pleasure or trying. I would even go as far as saying it’s up there with any single-origin, pour over coffee from your local trendy cafe. This is thanks to their brewing method. The process of freeze-drying the coffee, based on my drinking experience, truly does keep in the flavor. In addition to the taste, their packaging is minimalistic and environmentally conscious. This is always a plus, especially if you’re going to be getting regular shipments. All of these things are included so that Sudden Coffee can provide the best, most convenient coffee as possible. So, is it worth it? If you’re a coffee lover like I am, 100% it is. Having a great cup of coffee on the go or when you’re traveling is tough. Thus, you end up having to chug down some repulsive truck-stop coffee just to get your caffeine fix. If you’re looking for the best on-the-go coffee, definitely check out Sudden Coffee.